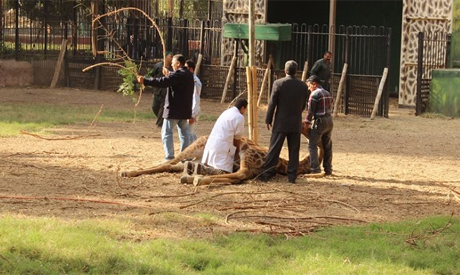 A female giraffe at the Giza Zoo ago choked herself to death on Wednesday afternoon. According to the zoo's official Facebook page, the giraffe suffocated after accidentally wrapping a food wire around its neck. Vets at the zoo tried their best to perform CPR on the giraffe, but it was already too late and the animal died. The giraffe had originally been brought to the zoo along with two others in July 2012. It marked the first time in five years that the zoo had any giraffes. Originally created by Khedive Ismail in 1891, the Giza Zoo is the oldest and largest in Africa. It may be the oldest and largest in Africa but is one of the worst and is a disgrace. It is a beautiful space for people to spend some time as the gardens and trees are stunning. However, it is most definitely not a beautiful space for any animal that has the misfortune of ending up there. Most of the animals are kept in dirty, disgusting conditions. The elephants are chained up 24hrs a day. The bears pace up and down showing psychological distress. The lions and panthers are in various states of starvation and neglect but thankfully most have no idea as they are drugged and used as photo props. The zoo also has a special house for breeding pedigree cats and dogs. This is not open to the general public and it a dark, stinking prison where the 'inmates' blink in surprise when the lights are turned on. They are festering in their own urine and faeces; it is one of the most depressing, disturbing sights I have ever seen. The sooner the zoo is shut down and re opened as just a gardens the better. It is no place for the precious animals that suffer there every day. They do not deserve it. Yes it is disgraceful and yet I have made numerous suggestions to the Four Season Hotel across the street to come up with solutions, the luxury and misery side by side or better across the street is sinful. The entire area is dirty, bad smell like a toilet because the zoo has not being cleaned. But yet nobody notice it neither the zoo Managment nor the Four Season Mamagemnt !!! Zoo's are animal prisons they deserve so much better.